My d-link system is mostly working. Direct access works local and from Internet. Mydlink.com cloud works too. 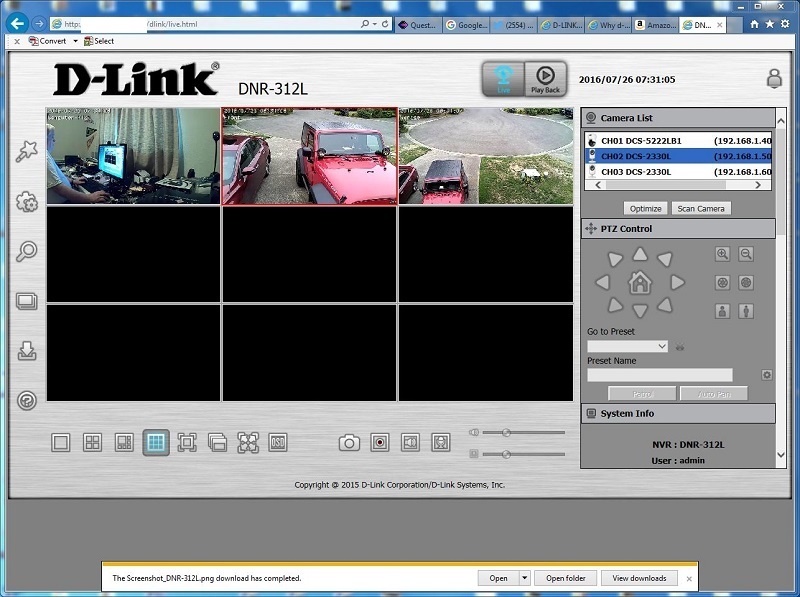 All cameras and dnr312 can be accesses. Everything seems to work fine from PC. I cannot access d-link dnr-312L from my Android. The former shows up but no cameras are listed and no video windows,are show on main page. I've tried this with 3 browsers and two different devices. Any idea what is,wrong? Fixable? Seems that of your PC is working fine with the cameras and DNR, that there maybe a problem with the Android itself. Was it's OS recently upgraded? All D-Link apps up to date on the Android? Try removing all D-Link apps, reboot the device, then re-install the apps. There doesn't seem to be any application for the DNR-312L for the android. There is View-NVR but that's designed to work for with the 202L. So my only option is to use the web based access, which is what doesn't work. It partially works, but like I said, no cameras detected and no videos shown. I have tested this on OS version 5.1.1 and now 6.0.1. And on 2 different devices (Samsung 6+ phone and Samsung Tablet), as well as 3 different web browsers. Apps have been removed and reinstalled. It's beginning to look like the DNR-312L is not compatible with smart devices. Guess it's time to recheck the manual and see if it is compatible with android. Since the interface is web based, I would think it should work, but it doesn't. This is how it looks on my PC. The DNR-312 is business class device. So it may not fully support some home class devices like android. My DNR-312L is at a remote site. In order to get around certain problems I've been having with remote access through the Dlink servers I've set up port forwarding in my modem/router to directly access the web servers in each device, camera or recorder. Regarding specifically the 312L and direct access to its web server, I've found that Chrome doesn't work at all, IE sort of works, but Firefox works the best. That said, my connection at the remote site is through a 1Mb/s ADSL connection and that is painful. I'll be upgrading to a faster connection if they ever get their new service installed. Though I don't use it much since I normally go direct from my laptop to the recorder web server, I can pull up a screen on my Android Samsung S5 and see the three cameras I've got configured for the recorder using myDlink View-NVR. My version of Android is 6.0.1.